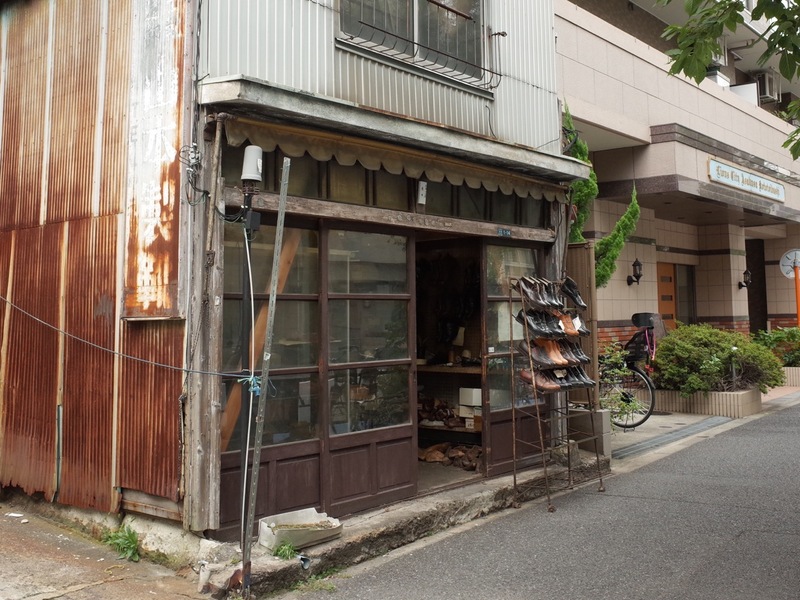 Shoemaker Masahiko Harada looks up through the open doorway against the daylight. 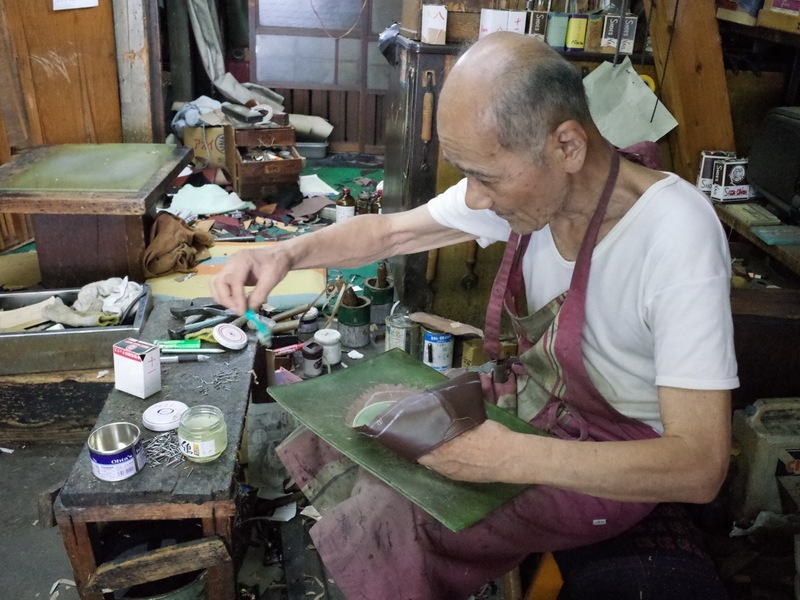 He is glueing some leather. He wears an apron, a loose white T-shirt, and what appear to be two different shoes with one sock. And what seems like a permanent expression of surprise. Yes do come in, he says, Yes, try some on! You are interested in buying, aren’t you? He is not being pushy. He is making sure you’re not just mucking around. He puts a wooden board on the floor, so you can keep the shoe clean. But I doubt they’ll be right for you, he says. Japanese feet are wider than foreigners’. He kneels down to feel the fit. 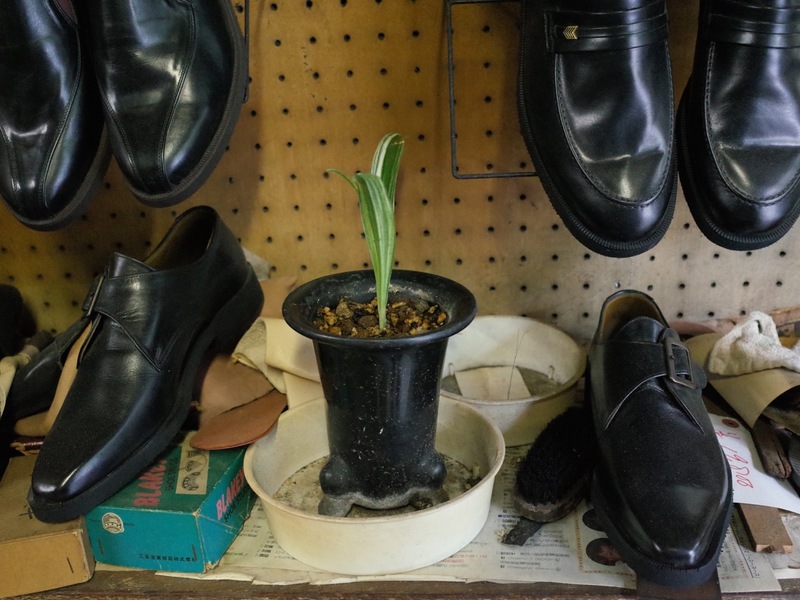 But you find a pair that feel good. You find another. 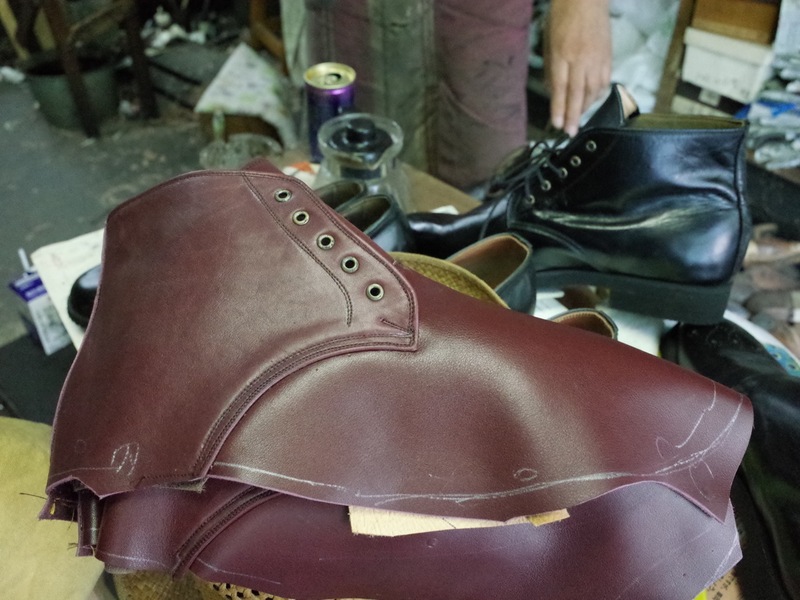 These ones look better, he says, about a pair of boots. You say you’ll buy them. The leather is very soft. You like the red boots too, but they are too big. I’ll make you some, he says. It will take about 10 days. He steps out the back and emerges with a pair of uppers in that same soft red, nearly complete. See, he says. They’re nearly done. It’s as if it’s fated, you say. 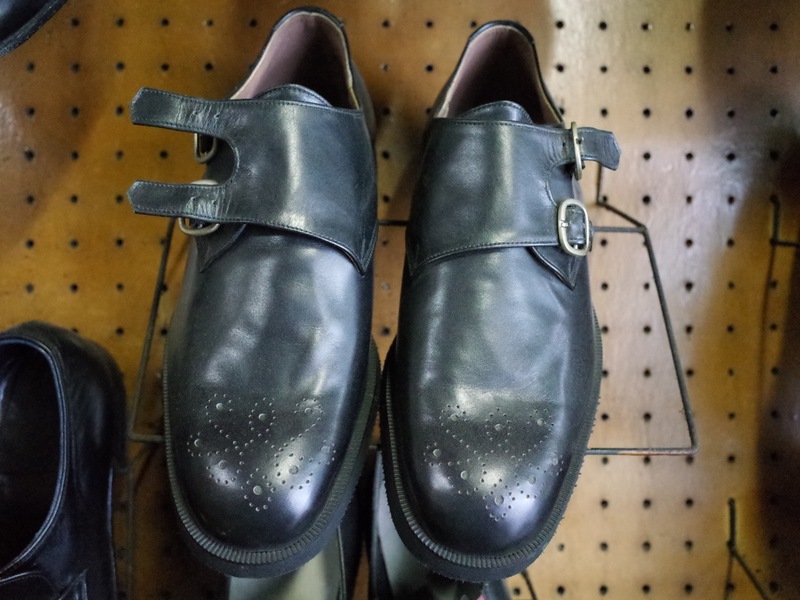 I am meant to buy these shoes from you. Yes fated, he says. A few days later you drop back in. This thing about wide and narrow feet. The boots you bought are fine, but a little loose over the top. So you want to ask him to make the red pair tighter. He stands up as you walk in. I’ve made them already, he says. He pulls them from the shelf and says, They’re very good, if I don’t say so myself. It’s refreshing to hear his confidence. And they are splendid. 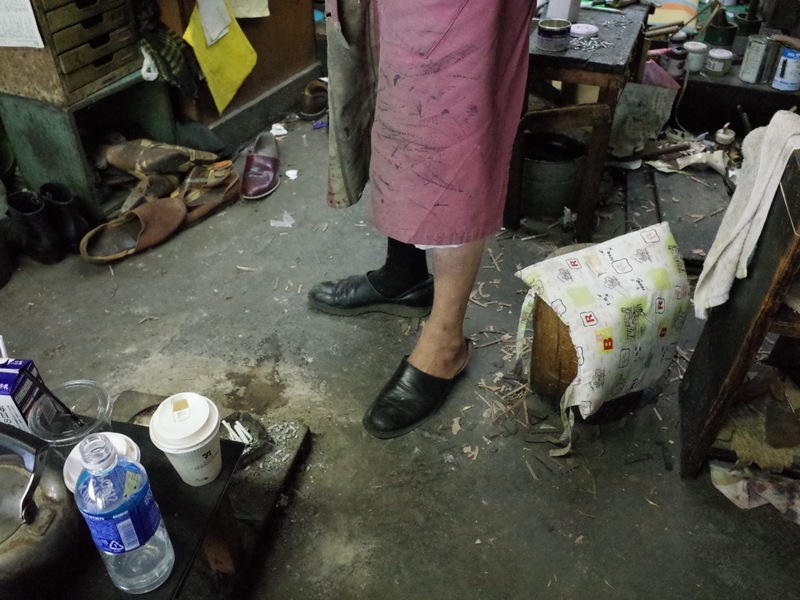 You ask if there is any distinguishing feature to these shoes, so that you know they are made by him. He squints, thinking. No. You know, I made all my shoes as a supplier. So we weren’t supposed to brand them. But I guess I could write my name in them. 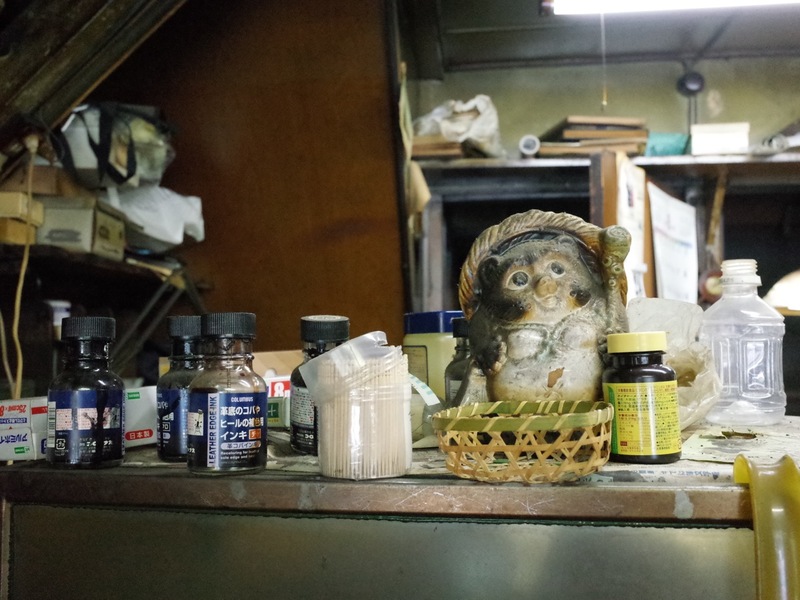 He sits down at the back of the shop and takes a ballpoint to the tongues of your shoes. 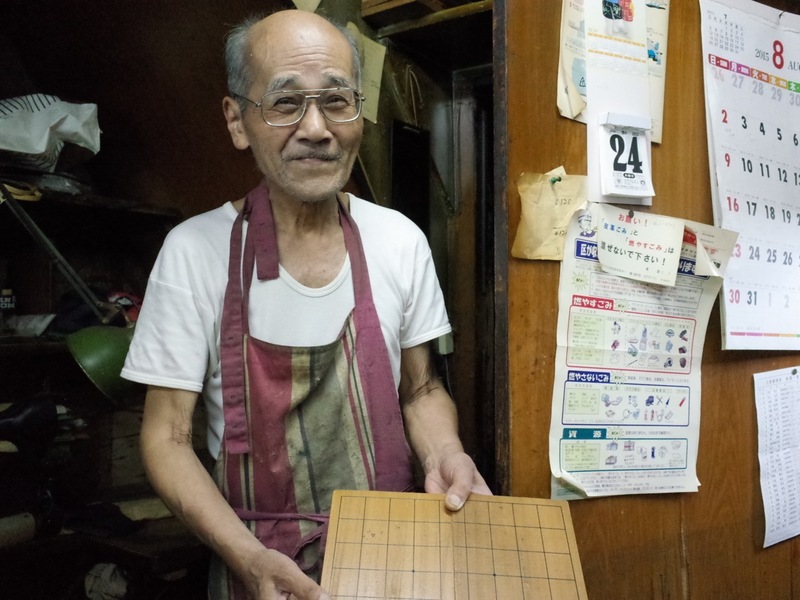 Continuing from last week’s conversation, he says he was playing shogi chess in your neighbourhood on Sunday, in the parlour with about 30 other players. How did he go? I won two, lost two, he says. He is 2nd-dan. Yep, I won all four games of the playoff, he says. But it will be very hard to reach 3rd. Some of the players are 7th or 8th. He pulls out a book of tactics. Sometimes I read this before going to bed, he says. 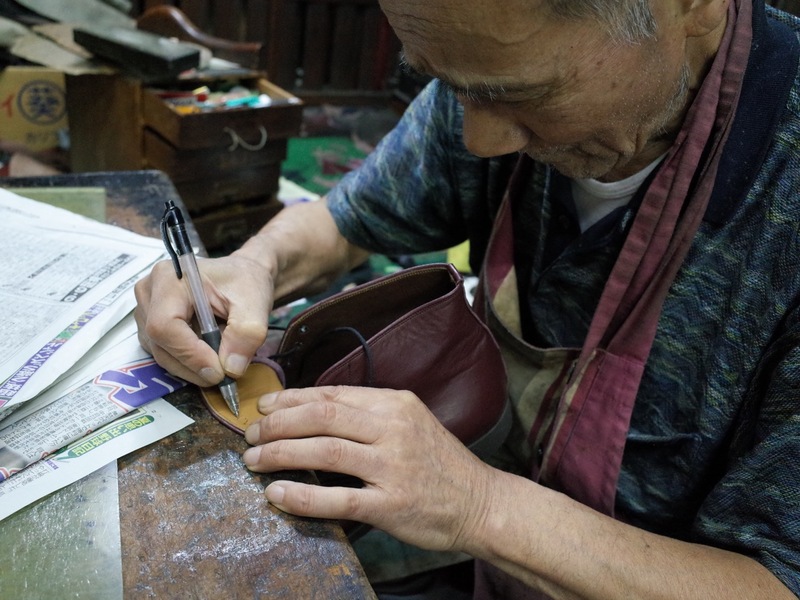 He is 76 and has been making shoes for 60 years. 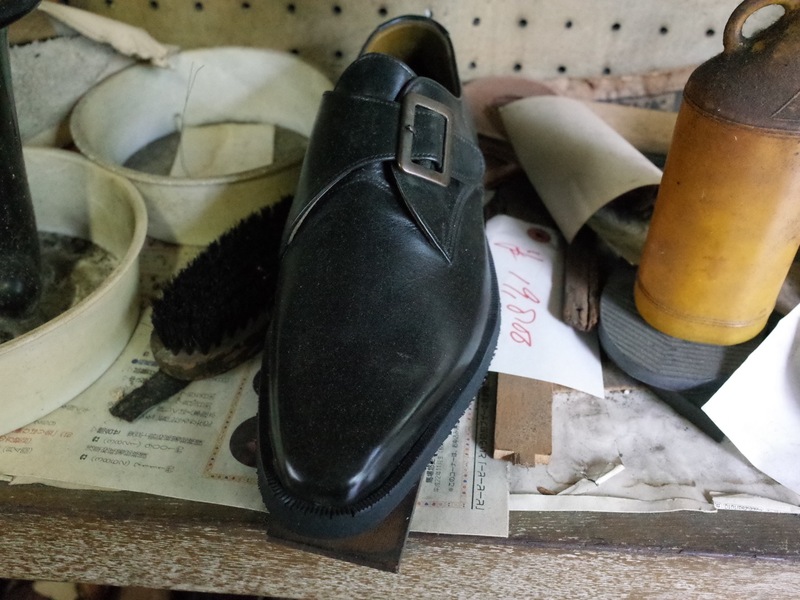 His father started shoemaking here in the early 1930s. 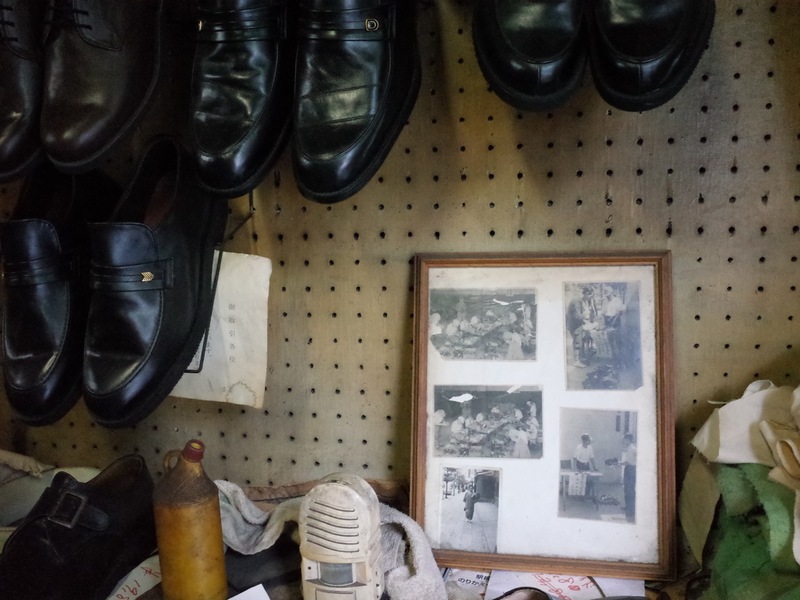 There’s a photo in the frame, Dad is selling shoes on the street before the war. Another of his mother, and some of their staff. 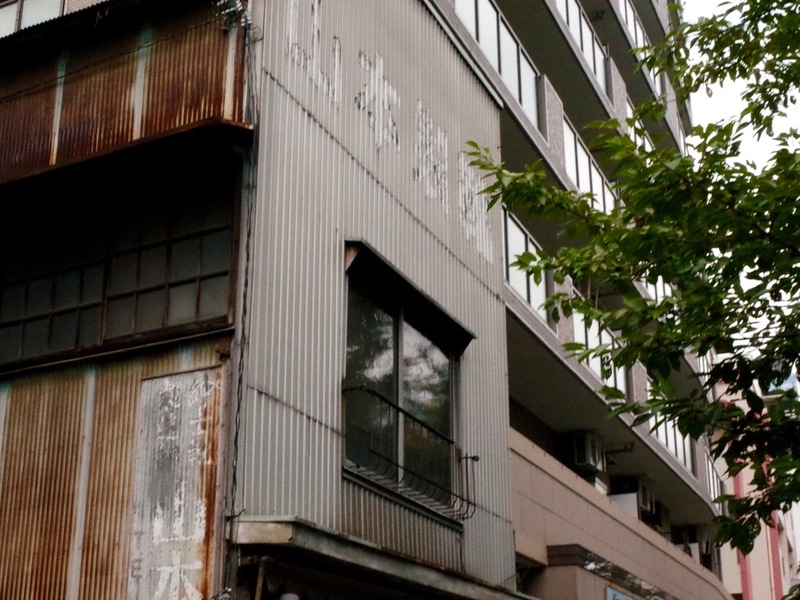 The place was destroyed in the US firebombing of 1945, but the family sheltered in his father’s hometown in Kanagawa. You bring some coffee from the 7-11 when you go to the ATM to pay him. The shoes are ridiculously cheap, considering their quality. He says he will make more for your friends with the same size feet, but his leather is in short supply. He works at his own pace. 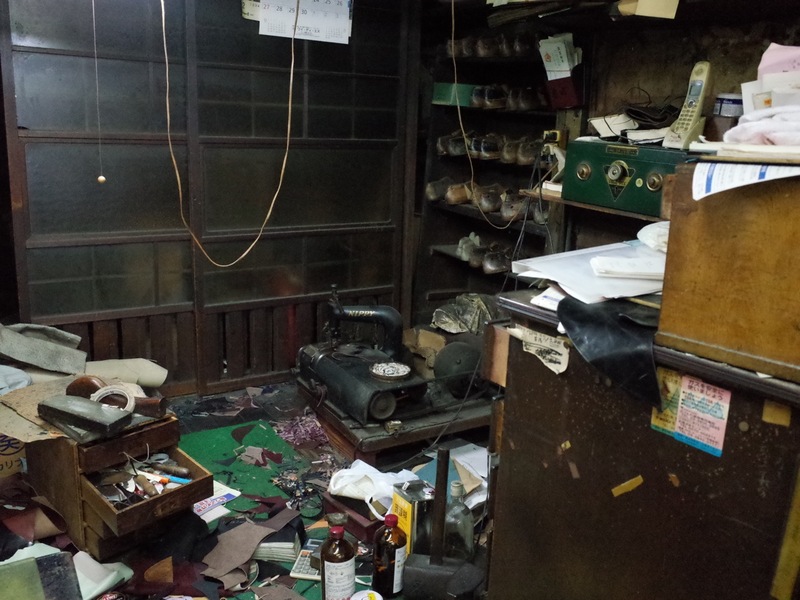 Tony, It’s less a shop than a sort of workspace. It’s off Kototoi-dori to the left before Kototoi bridge, as you are heading east (from Asakusa side). There are two big roads there on your left that split, it’s on the one further from the river. Almost next door to the 7-Eleven.